You ask people who their favourite footballer is, and the usual names that come out of the hat are Messi, Ronaldo, Ronaldinho, Zidane and the perennial Beckham. You ask me who my favourite footballer is. 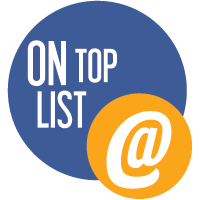 There’s only one name I will tell you. Thierry Henry. TH14. The King of Highbury. Arsenal Legend. The official Twitter handle of the Indian Super League (@IndSuperLeague), asked its fans to describe their favourite Thierry Henry moment. Come to think of it, this is a very tough ask. Cherry-picking one moment out of so many, is nearly an impossible task for me. I mean, this man has given me and my fellow Arsenal fans countless moments of magic. 228 goals, in 377 games. And each one a beaut. Who can forget that magical night at the Bernabeu, when Henry strode past several Galacticos defenders? I remember watching that match, it was well past midnight, and I woke up the entire house. A swivel and turn against Chelsea left the Blues with really no chance at all. Or when he fooled a bunch of Liverpool defenders to score a beauty against Liverpool, when at one point it seemed like the title was slipping away from us. Do you remember that time when Denis Irwin didn’t realise that a wily Frenchman had bamboozled him? How about when the best goalkeeper in the world, Gianluigi Buffon stood absolutely no chance? Remember when he made the Tottenham fans cry and got himself a statue of that moment? Oh my word, what a goal that was! You absolutely cannot cannot forget that cold night in Prague, when Thierry wrote himself into Arsenal books as their record goalscorer. Javier Zannetti had no chance when Thierry was on fire in Milan. He scored a cracker when he ran the length of the pitch, beat the Argentine and slotted the ball home. It all started on a balmy evening at Southampton’s old ground – The Dell. That late late header at the Emirates against Manchester United. I screamed like there was no tomorrow. Henry doesn’t score too many headers, and when he does, it’s like this! Electrifying, electrifying – These words still ring in my ears, for that goal against Leeds, back in 2004! Remember that blazing shot against the rain and wind against Manchester City! That was simply majestic. To cap it all off, he signed off from Highbury with a penalty kick and a kiss of the turf in front of the North Bank. The most iconic Thierry Henry moment. So, there you go! My 14 favourite Thierry Henry moments for Arsenal! Aaron Ramsey produces a quality finish to end Arsenal’s 9 year trophy drought after playing a beautiful 1-2 with Olivier Giroud who places a perfect backheel for the Welshman. 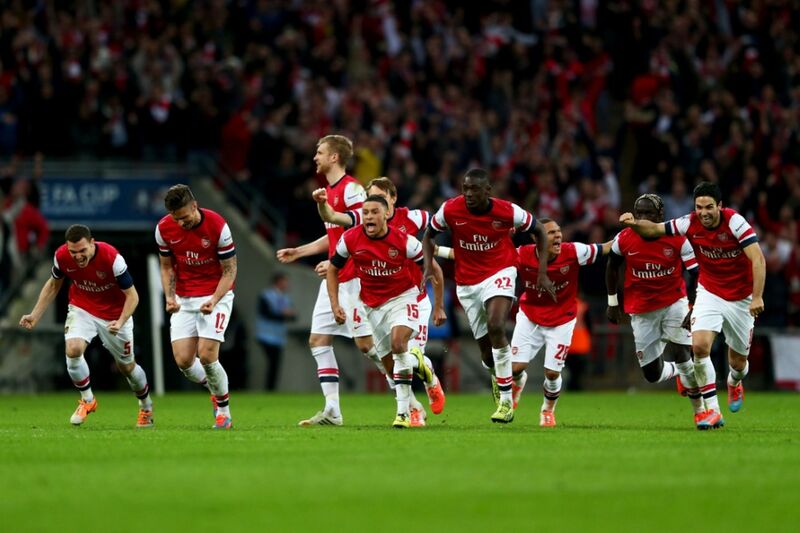 Cazorla fires in a fine free kick to halve the deficit as Arsenal fight back from 2-0 down to 3-2, to lift the FA Cup. Tomas Rosicky’s belter in the 2nd minute leaves French international keeper Hugo Lloris with no chance. Olivier Giroud produces a Bergkamp-esque finish, after taking down a hopeful long ball hoofed up by Thomas Vermaelen, with his right foot. Olivier Giroud latches on to a long pass from Mikel Arteta to unleash a thunderbolt on his return from injury, but Arsenal still lose 2-1 at home to Manchester United, despite dominating. Alexis Sanchez scores his best Arsenal goal yet, under pressure from Neven Subotic to beat Roman Weidenfeller with a fine curving shot. 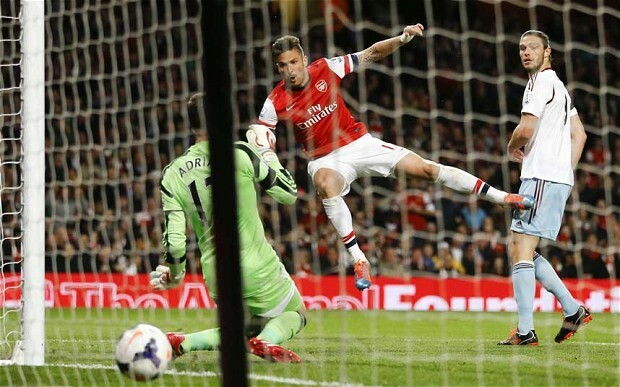 Olivier Giroud’s wonderfully dipping shot leaves Wily Caballero with absolutely no chance to save. Some fine passing culminates in a brilliant goal from Jack Wilshere who leaves his England teammate Joe Hart rooted to his spot with an angled finish. Tomas Rosicky makes a fine run, exchanging passes with both Cazorla and Wilshere, before being beatifully dinked by Giroud, for a subtle chip over Mannone. Aaron Ramsey smashes a left-footed volley from 35 yards to stun Sinan Bolat (and Wojciech Szczesny), and nominate himself for Champions League Goal of the Season. This was a strange match really, and till this day I can’t understand how an Arsenal side that dominated the entire game against Manchester United’s worst side in years, contrived to lose. When Louis van Gaal named a defense of Paddy McNair, Chris Smalling and Tyler Blackett, Arsenal fans could be forgiven for rubbing their hands in delight. Arsenal created chance after chance, which they either wasted, or shot them straight at the mercurial United keeper David de Gea. Manchester United got their first goal, completely against the run of play, and even without a shot on target, as Antonio Valencia’s shot was deflected into the goal by a wayward leg from Kieran Gibbs. Arsenal created more chances, but just couldn’t score. Wayne Rooney scored his customary goal in this fixture from a quick break. 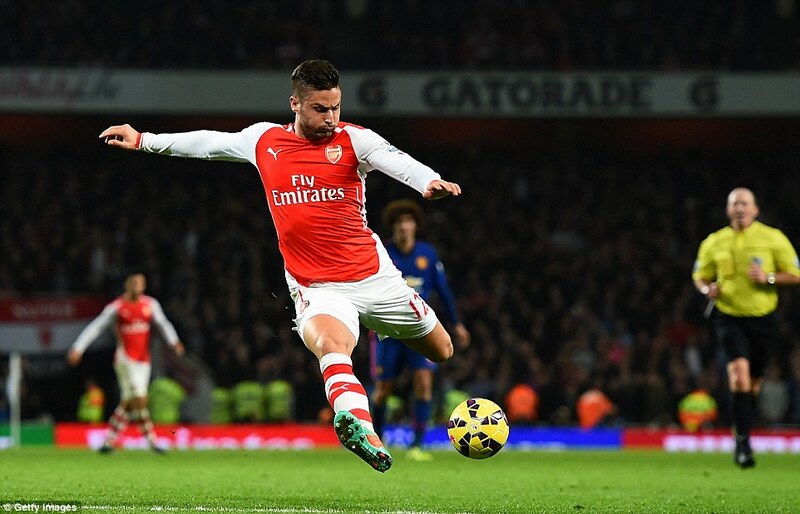 Olivier Giroud scored a fantastic goal late on, but it was too little, too late. 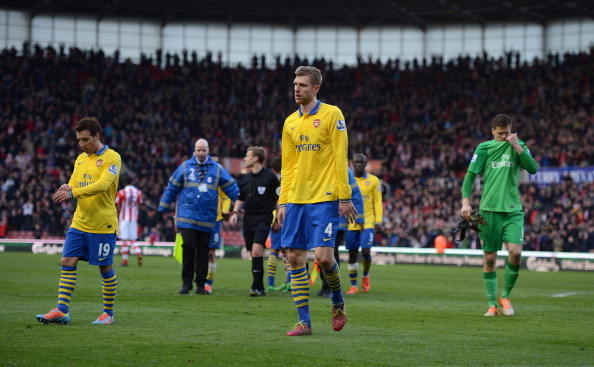 Arsenal’s title challenge looked to be slowly fading away as they slipped up at Stoke. In a dull afternoon of football, barely any chances were created. The Gunners looked insipid and Stoke were happy keeping Arsenal at bay. The decisive moment came when Laurent Koscielny was harshly adjudged to have handled the ball in the penalty area as he went for a challenge with Jonathan Walters. 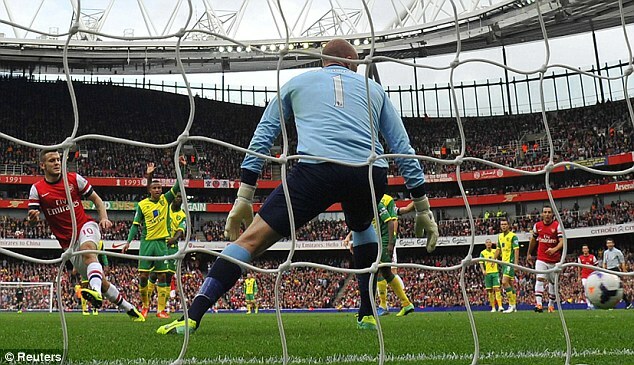 Walters scored the ensuing penalty ensuring Arsenal’s drop to 3rd position. Arsenal were again undone by a red card on the European stage as they slumped to a home defeat to Bayern Munich for the second season running. Despite Arsenal’s faltering domestic form, optimism was still high ahead of the Champions League clash with mighty Bayern. 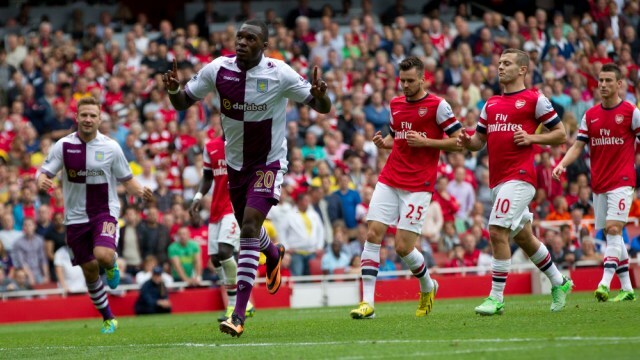 The shocking news was a start handed out to rookie striker Yaya Sanogo, preferred to Olivier Giroud. Both sides started the match at a quick pace, and Arsenal forced two saves from Manuel Neuer off Sanogo and Chamberlain, who was causing Austrian left back David Alaba plenty of problems. The big chance of the match fell to Mesut Ozil on 14 minutes, when he beat Jerome Boateng in the penalty box, and his compatriot bought him down with a trailing leg. 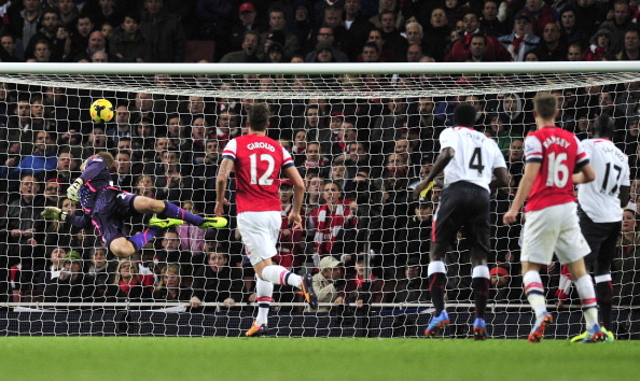 However, Ozil’s weak penalty was saved easily by Neuer. Arsenal lost their direction after the miss, as Bayern started rolling the ball around. The Gunners suffered a setback when Kieran Gibbs had to be taken off due to a hamstring injury. But, 6 minutes later disaster struck, as Szczesny was sent off for colliding with the onrushing Arjen Robben in the 37th minute. Robben made the most of it, but Bayern missed the penalty as Alaba screwed it wide. 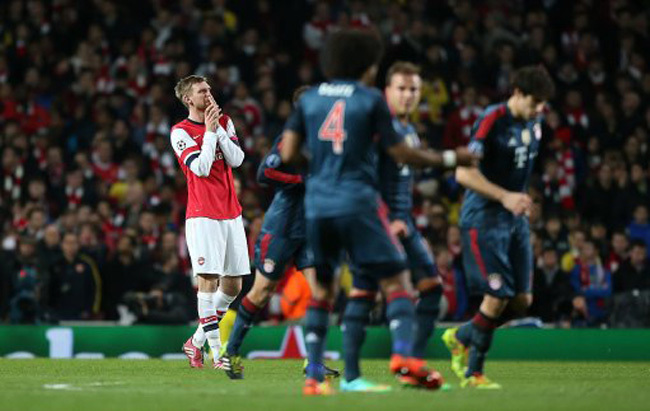 The Gunners stood no chance in the second half as Bayern drew their tanks closer. Toni Kroos scored a beauty in the 54th minute, leaving Fabianski with no chance. Arsene Wenger would have been happy with a 1-0 loss, but Laurent Koscielny went too far ahead late on in the game, allowing Mueller space to convert the second goal for the visitors. Arsenal suffered a disappointing loss on a watery evening at the Liberty Stadium, days after they succumbed to a 3-3 draw against Belgian champions Anderlecht. Swansea dominated initial proceedings before Arsenal showed flashes of brilliance in the lead up to half time, but neither side could take advantage. 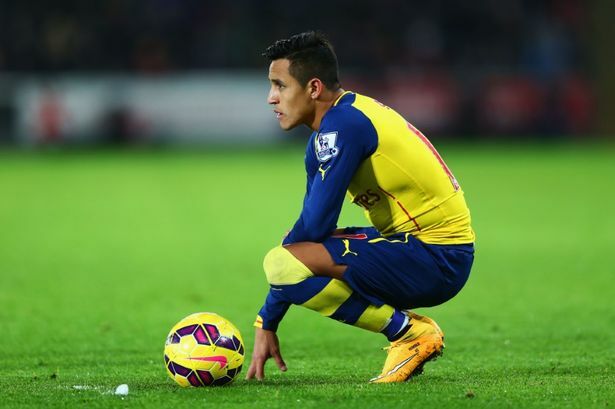 Arsenal had the lead in the 63rd minute, Alexis with a simple finish past former Arsenal goalkeeper Lukasz Fabianski. Swansea equalized through a brilliant free-kick from Gylfi Sigurdsson, after Kieran Gibbs fouled debutant Modou Barrow. However, Swansea turned the match on it’s head, when Ecuadorian winger Jefferson Montero, who ran Callum Chambers ragged all afternoon, crossed in for France international striker, Bafetimbi Gomis for the winner. Arsenal’s miserable record at the Britannia Stadium continued, as they were beaten 3-2 by the Potters, in a game where they failed to show any sort of formidable threat. Arsenal’s form seemed to be improving, after they registered 3 consecutive wins over Dortmund, West Brom and Southampton, but they were undone in the very first minute, as Peter Crouch took advantage of a calamitous moment of misunderstanding between stand-in goalie Emiliano Martinez and Callum Chambers. After Olivier Giroud missed an open header, Stoke scored their 2nd goal in the 35th minute, when a Jon Walters cross allowed former Barcelona, Milan and Roma man Bojan to make it 2-0. Walters then got one of his own at the stroke of half-time, making it an unbelievable 3-0. Arsenal briefly rallied when Cazorla scored a penalty and Aaron Ramsey’s fine finish in the 70th minute, but in honesty, Arsenal deserved to lose by a bigger margin. Arsenal were outrun, outfought and outbattled by a side struggling for survival in the Bundesliga. Dortmund, who have suffered a terrible start to the domestic season so far, showed it didn’t matter in Europe as they heckled Arsenal to a 2-0 win. The Gunners, without Olivier Giroud, Kieran Gibbs, Nacho Monreal and Mathieu Debuchy, struggled to get anything going for them, in a match dominated by the die Schwarzgelben. Italian forward Ciro Immobile put the home side in the lead on the stroke of half-time, before Gabon international Pierre-Emerick Aubameyang made it 2-0, minutes after the second half started, following a confusion between Szczesny and Koscielny. 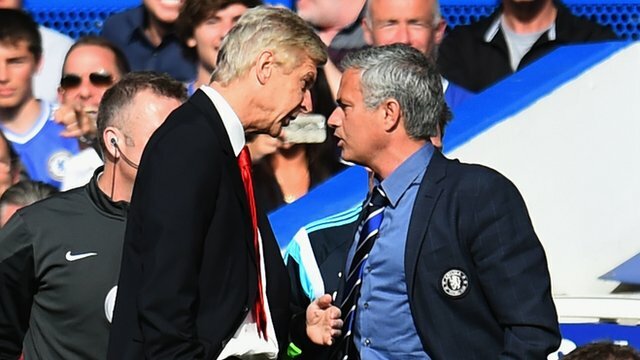 Arsene Wenger’s poor record against Jose Mourinho showed no signs of letting up, as Arsenal put up a pale performance yet again at Stamford Bridge. The only positive probably was that the Gunners didn’t get pasted 6-0 this time round, but that was little excuse for a insipid performance, devoid of any sort of creativity. Chelsea, as usual, stuck to their game plan, stifled the hell out of Arsenal, and scored two goals on counters. The highlight of the match was Wenger and Mourinho having a go at each other on the touchline after a Gary Cahill challenge on Alexis. Eden Hazard was bought down by Koscielny in the box, and the Belgian duly stepped up to make it 1-0. Fabregas, who got a mixed reception from the away fans, provided the assist for the second goal, to set up his Brazilian born compatriot, Diego Costa for a fine second goal. Everton stepped up their pursuit of 4th place, with a thumping win over a subdued Arsenal. Steven Naismith scored the opening goal after Lukaku’s initial shot was saved and the Belgian striker made it 2-0, 20 minutes later, after he heaved his way through Arsenal’s leaky defence. The afternoon was made more miserable as former Everton midfielder Mikel Arteta scored an own goal on his return to his old stomping ground, when he was pressurized by Kevin Mirallas. This win put Everton just one point behind Arsenal, with a game in hand, and 5 games left for the Gunners to play in the season. Arsenal were thoroughly demolished in a 20 minute blitz of super attacking football by Liverpool. Arsenal arrived at Anfield, top of the table but were made to look like a pub side suffering from a bad hangover in the opening minutes, as Liverpool carved them open again and again. With barely a minute gone on the clock, Slovenian defender Martin Skrtel put Liverpool ahead with a header from a Steven Gerrard’s corner. Arsenal had barely got the ball rolling, when Liverpool and Skrtel struck again. Steven Gerrard provided the assist again, as Skrtel’s header glided past Chamberlain on the goal line. Liverpool should have added a 3rd just seconds later, but his chipped effort went just wide. Then, a low cross from Sturridge failed to find Suarez. Then, the Uruguyan unleashed a powerful volley straight at Szczesny, who managed to save and Kolo Toure missed with the goal gaping open. Arsenal were clinging on to their lives, but on 16 minutes it was 3-0, as Sterling converted rather easily from a Suarez cross. 4 minutes later, Sturridge beautifully made it 4-0 collecting Coutinho’s pass from the deep. 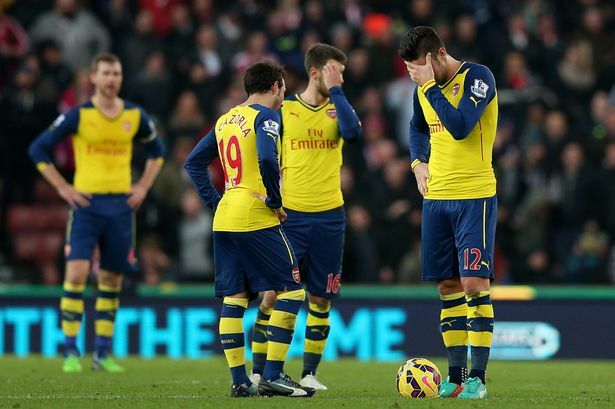 There was absolutely no way back for Arsenal, who barely mustered anything going forward. Defensively, well they held on till half time, and 7 minutes after half time, when Sterling scored his second and Liverpool’s 5th. 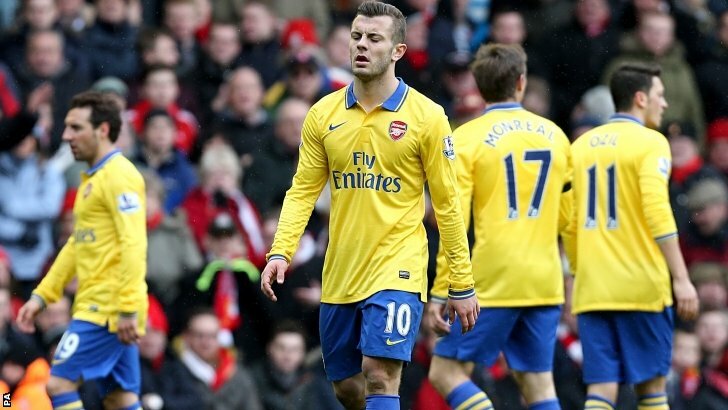 Arsenal got a consolation goal back, when Alex Oxlade-Chamberlain was fouled in the penalty area by Steven Gerrard. 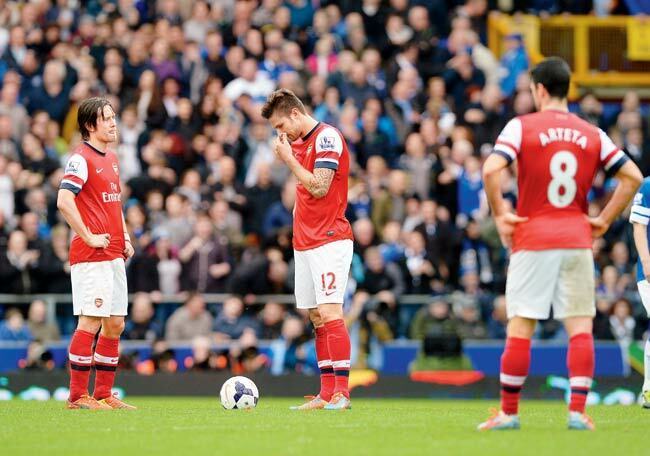 Mikel Arteta scored to make it 5-1, but the scoreline was still an embarassing one. On what was supposed to be a momentous occasion for Arsene Wenger, who reached the milestone of 1000th game in charge of Arsenal, it turned out to be one of the most shambolic displays in the Frenchman’s reign, as Arsenal were ruthlessly taken apart by Jose Mourinho’s rampaging Chelsea side. Samuel Eto’o scored with just 5 minutes on the clock with his left foot, and just 2 minutes later German international Andre Schurrle scored a similiar goal. The comical/disastrous/strange moment of the match came 10 minutes later, when Alex Oxlade-Chamberlain stupidly handled the ball in the penalty area. 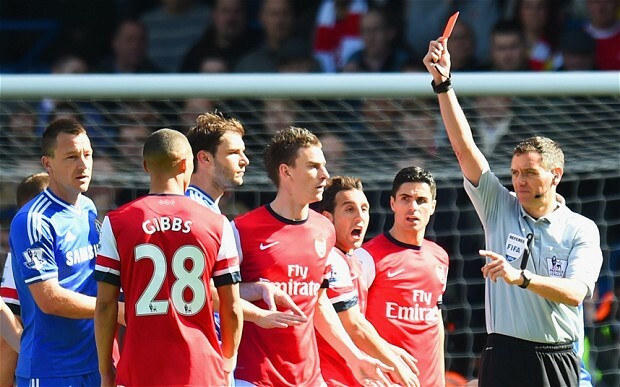 In the melee, Andre Marriner sent Kieran Gibbs in a case of mistaken identity much to Arsenal’s fury. Eden Hazard scored the resulting penalty. All so typical Arsenal. Chelsea 3-0 up inside 17 minutes. Then came a period of brief solidity, as Brazilian Oscar scored an easy goal having been set up by Fernando Torres. Arsenal’s 10 men displayed some sort of steel in the second half, but couldn’t prevent the Blues from scoring. Oscar doubled his tally and then new signing Mohomad Salah, beat the offside trap to score an easy goal past a bewildered Szczesny. A rather disastrous display on a day that was supposed to be a memorable one. It’s been a topsy turvy year for Arsenal Football Club. From the lows of thumpings at Anfield and Stamford Bridge, to the highs of lifting two pieces of silverware. Here are Arsenal’s 10 best games of the year. Arsenal garnered only one point from an exciting Premier League clash against Manchester City, despite putting the defending champions on the backfoot several times during the match. Danny Welbeck made his debut in Arsenal colors, and almost put the home side ahead after a poor back pass from David Silva, but only managed to strike the post, with only Joe Hart to beat. Jesus Navas was running Arsenal ragged and assisted Sergio Aguero for the opening goal in the 28th minute, a low finish past Szczesny. Arsenal equalized only in the second half, when some fine passing played in for Jack Wilshere, who beat Hart with an angled finish. 11 minutes later, Arsenal had the lead, as Alexis thumped home a volley off a Wilshere header. 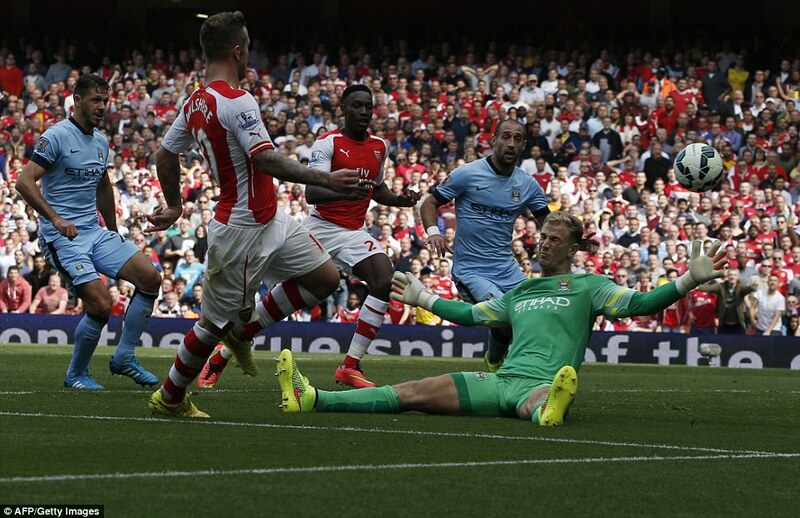 When it looked like Arsenal would hold on for a win, Demichelis struck an unmarked header with 7 minutes left to play. Arsenal edged Tottenham in a tense encounter at the Lane. 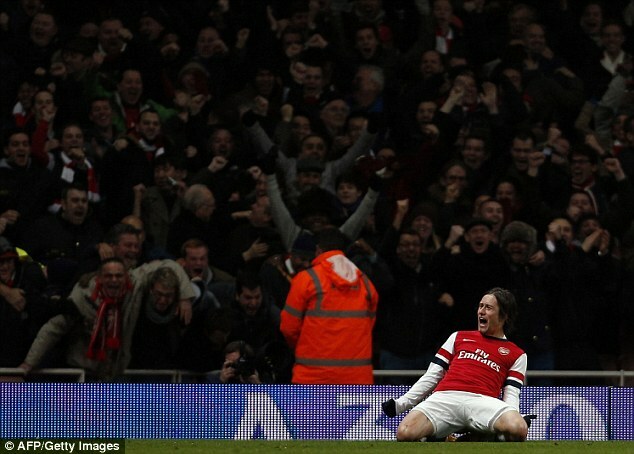 The Gunners, a side ravaged by injuries, took the lead with only 72 seconds played as Tomas Rosicky unleashed an unstoppable thunderbolt past Hugo Lloris. Despite Sp*rs creating several chances, Arsenal defended their hearts out to seal a vital 1-0 win on their way to secure a top-4 finish in the Premier League. The best moments came after the match, as Arsenal players took selfies on the pitch, much to the bemusement of the Tottenham faithful. Arsenal’s second string put in a commanding display at the Turk Telekom Arena, to put to rest some ghosts of the recent 3-2 drubbing at the hands of Stoke. Much maligned German international Lukas Podolski put Arsenal into the lead with a typical thunderous left-footed volley, after having been put through by Aaron Ramsey. The in-form Welshman turned scorer 7 minutes later, when he latched on to a Chamberlain pass to make it 2-0 past Sinan Bolat. 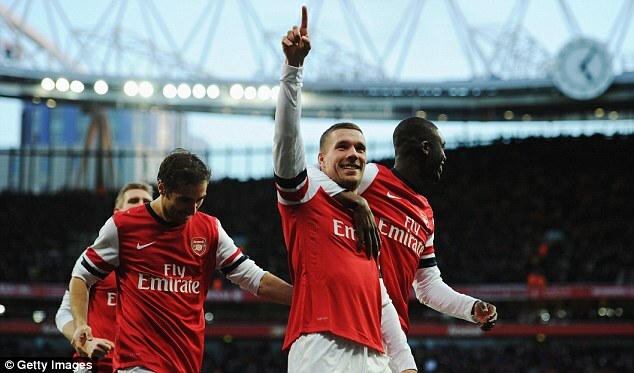 After Podolski had struck the post, Ramsey scored a contender for Goal of the Season, with a rocket of a effort. After a cleared corner, the ball fell to Ramsey, 30 yards from goal, and he unleashed an unstoppable first-time shot which ended up at the back of the net, stunning some of his own teammates. Wesley Sneijder scored a consolation free-kick in the 88th minute, but Podolski restored the 3 goal win with a simple finish in the 92nd minute. After consecutive losses in the league to Swansea and Manchester United, Arsenal registered a much needed 2-0 over struggling German side Borussia Dortmund. Dortmund, whose Champions League form is a complete contrast to their domestic form, where they languish in the relegation zone struggled to get their game going against a determined Arsenal side. With many fans concerned over the inclusion of Yaya Sanogo in the squad, the young Frenchman put the home side in the lead with just over a minute played, after a one-two with Santi Cazorla. He could have made it 2-0 in the 9th minute when he was put clean through, but he typically made a hash of it. It didn’t matter, as Alexis scored a beauty in the 56th minute, past Weidenfeller, under close pressure from Neven Subotic. 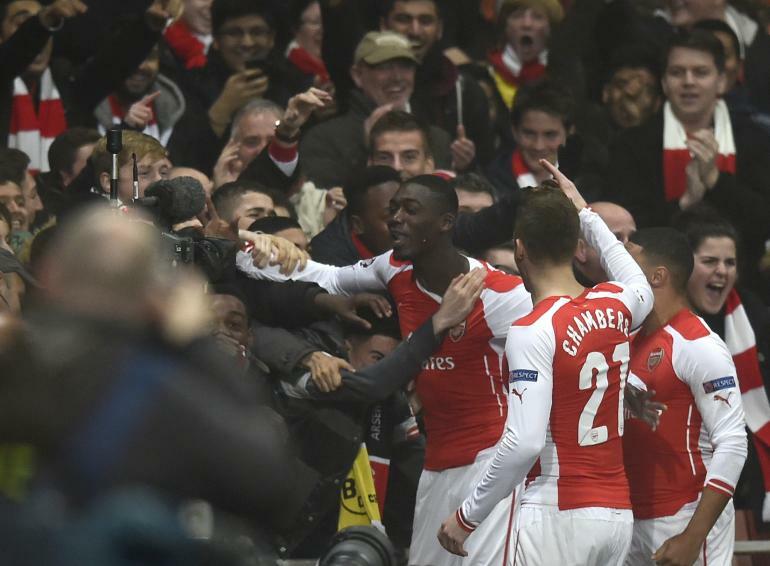 Arsenal’s passage to the knockout stages was made simpler with this vital victory. Danny Welbeck showed the Arsenal faithful what he is capable with a stunning hattrick in the Champions League Group stage game against Galatasaray. It was only the first hattrick in the young England international’s career. Welbeck beat Brazilian inernational Felipe Melo, before sliding the ball under Fernando Muslera for his first goal. The second goal was a gift, as a wayward back header from Aurelien Chedjou allowed Welbeck to race on to it, to beat Muslera again. Mesut Ozil and Alexis Sanchez combined for the third goal, before Welbeck made it 4-0 in the second half, lifting a Chamberlain pass over the keeper. It was easy peasy against expensively assembled Sp*rs, as the Gunners entered the 4th Round of the FA Cup with a 2-0 win over their North London rivals. Young German Serge Gnabry put Santi Cazorla through for the first goal, who scored past French international keeper Hugo Lloris with a fine shot. Arsenal finished off the game with a beauty from Tomas Rosicky who robbed a sleeping Danny Rose near half line, ran the length of the pitch before beating Lloris to put the Gunners 2-0 ahead. 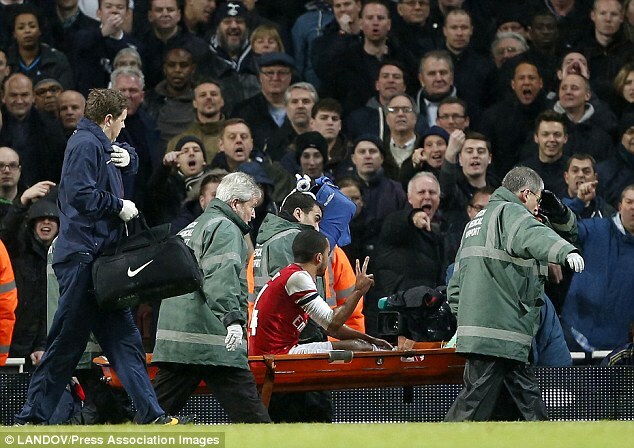 The enduring image of the night was Theo Walcott signalling the scoreline with his fingers to the Sp*rs faithful as he was stretchered off later in the game. A week after Liverpool knocked the wind out of Arsenal’s sails, the Gunners extracted a measure of revenge from the Merseyside club by knocking them out of the FA Cup with a gritty performance on a balmy evening at the Emirates. Liverpool made the brighter start of the two sides, as Arsenal nervously held on. But, it was the Gunners who took the lead, when Yaya Sanogo’s miscued shot rebounded off Gerrard, right into the path of Chamberlain who scored past Brad Jones to make it 1-0. Liverpool, with the attacking brilliance of Sterling, Sturridge, Coutinho and Suarez were held off by a stern Arsenal defence. 2 minutes after the break, the Gunners doubled their advantage. Mesut Ozil released Chamberlain on the right, who cut back for Podolski, the German finishing with aplomb with his right foot. 2-0 Arsenal. Steven Gerrard halved the deficit with a penalty 12 minutes later, but despite all of Liverpool’s chances, dives, and oh a wrong call by the ref, the Gunners held on to ensure progress. Arsenal comprehensively beat another Premier League side to make their way to Wembley for a FA Cup semi final showdown with defending champions Wigan Athletic, by beating Everton 4-1. Arsenal made early strides, as Mesut Ozil latched on to a Cazorla pass to slot home the opening goal on just 7 minutes, his first goal in 2 months. Young Everton keeper Joel Robles kept further efforts from Sanogo and Chamberlain out, before Everton found an equalizer. The talented Ross Barkley crossed in for Kevin Mirallas, whose shot was bundled home by his Belgian compatriot Romelu Lukaku. Everton had the chance of the game on 54 minutes, but Ross Barkley missed. Alex Oxlade-Chamberlain was fouled by Gareth Barry on 68 minutes, and Mikel Arteta converted the resultant spot kick. There was no looking back after that as substitute Olivier Giroud scored twice in 3 minutes to knock the Toffees out. 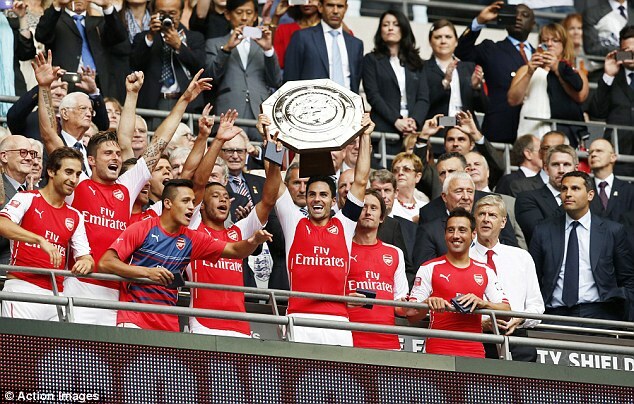 Arsenal returned to Wembley, 3 months after breaking their trophy drought, to face Premier League champions Manchester City in the traditional Community Shield clash, in emphatic fashion. With new signings Callum Chambers, Mathieu Debuchy and Alexis Sanchez on display, the Gunners got off to a flying start, taking the lead in the 21st minute, with a neatly placed finish past Wily Cabellero. Arsenal looked fluid in midfield and solid in defense, as Manchester City struggled to get any sort of grip on the game. Yaya Sanogo helped Ramsey make it 2-0 in the 42nd minute, before Olivier Giroud’s wonderfully dipping shot in the second half sealed a dominant display, sending out a message to the rest of the league. 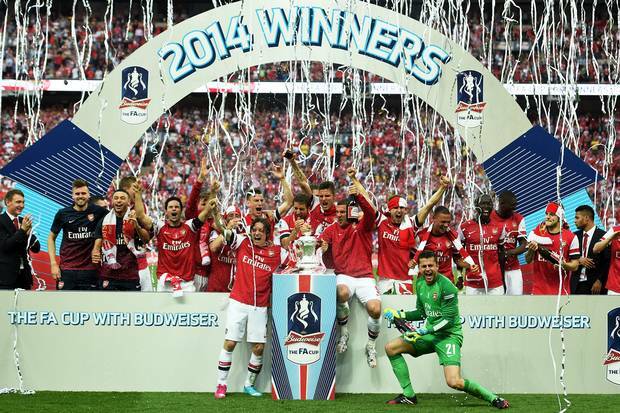 Arsenal ended their 9 year trophy drought in typical Arsenal fashion on wet afternoon at Wembley. Coming into the game as favorites against Hull City, the Gunners were caught on the backfoot within 8 minutes of the game, as the Tigers scored twice. First James Chester poked the ball home from close range, before Curtis Davies latched on to a stray ball to make it 2-0. They almost made it 3-0, through Alex Bruce, but for a timely clearance off the line by Kieran Gibbs. Santi Cazorla scored a fine free kick on 17 minutes to make it 2-1. Both teams battled hard for the next goal, and it was the Gunners who got their equalizer, as Laurent Koscielny swivelled home from close range. It was befitting that Arsenal’s best player this season, Aaron Ramsey score the winner that would end a painful period, trophy-wise for the club, as he drove home a backheel from Giroud. It was a classy finish on an emotionally absorbing afternoon. 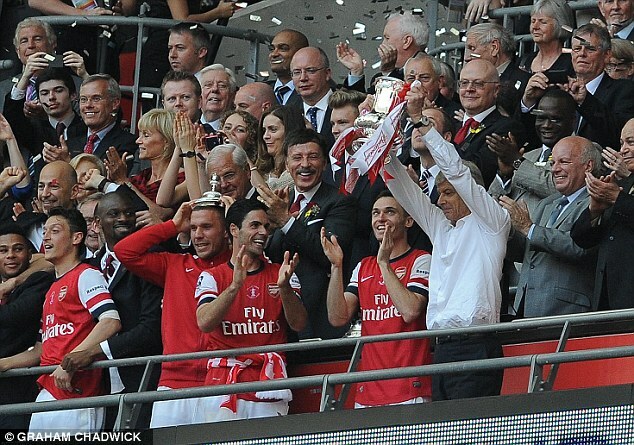 The smile on Arsene Wenger said it all! The team created this beautiful picture after Mesut Ozil scored his first goal for Arsenal in style against Napoli. 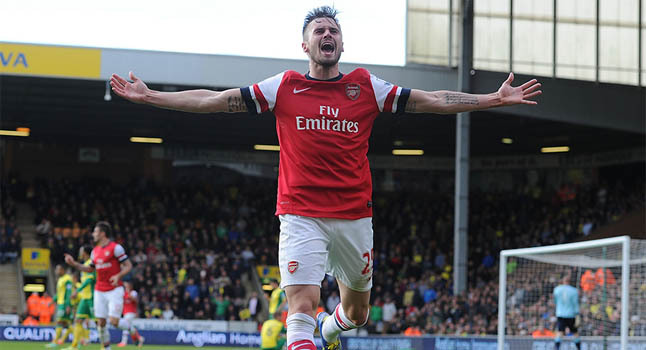 Carl Jenkinson shows his jubilation on scoring his first goal for his boyhood club since he joined 3 years back. He just loves scoring against them, doesn’t he? Per Mertesacker goes beserk after scoring the all important equalizing goal, making amends for earlier conceding a penalty against Wigan in the FA Cup semi-final. 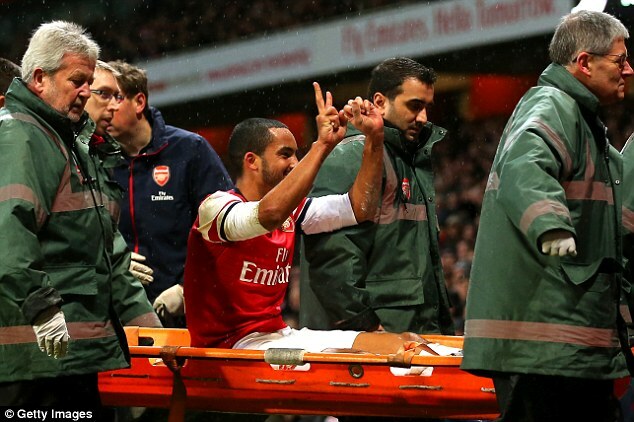 Theo Walcott shows the scoreline with his fingers as he is stretchered off, much to the anger of the Sp*rs fans! 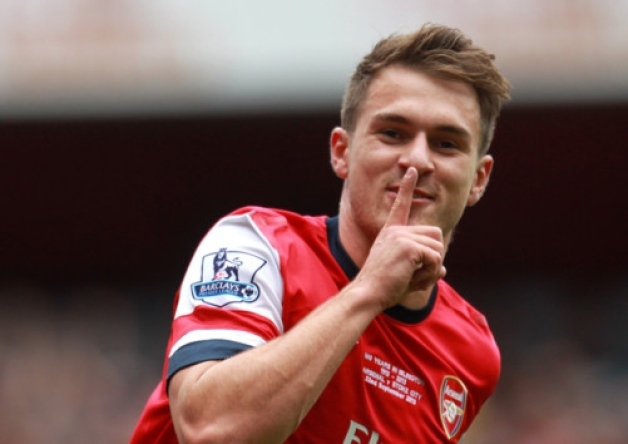 Aaron Ramsey tells the Stoke fans to shut up after scoring against them. 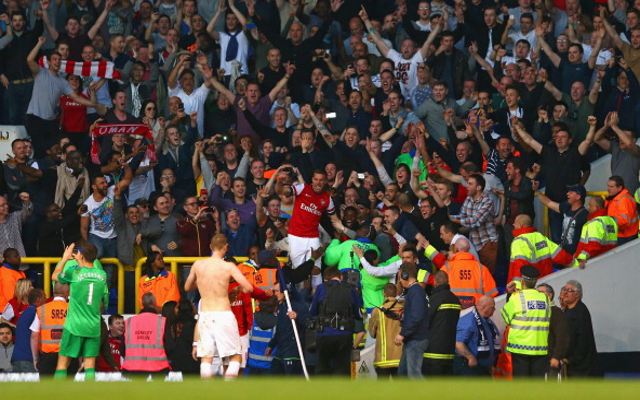 Podolski goes wild, by launching himself into the fans after a 1-0 win at White Hart Lane. 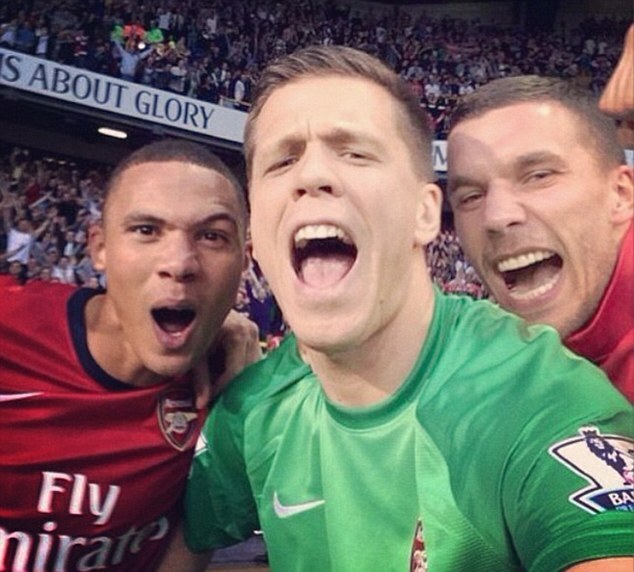 Szczesny gets his phone from the bench after the win at White Hart Lane, and takes a selfie of himself, Gibbs and Podolski! Epic! 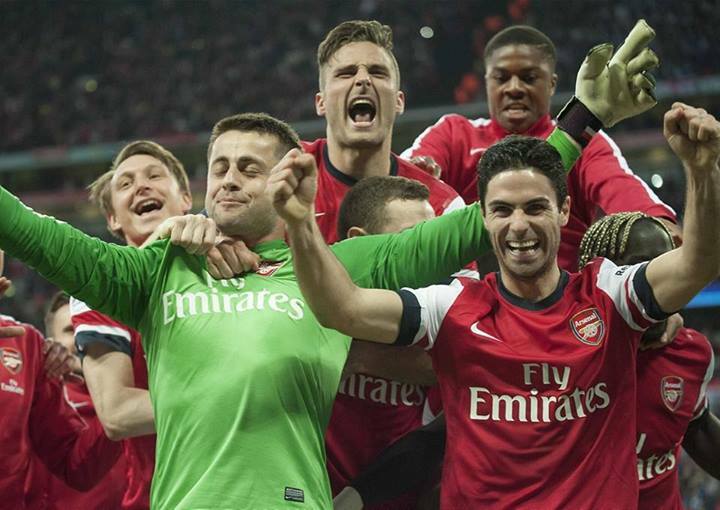 Arsenal players looks massively relieved after winning a tense penalty shootout against Wigan in the FA Cup semi-final against Wembley. 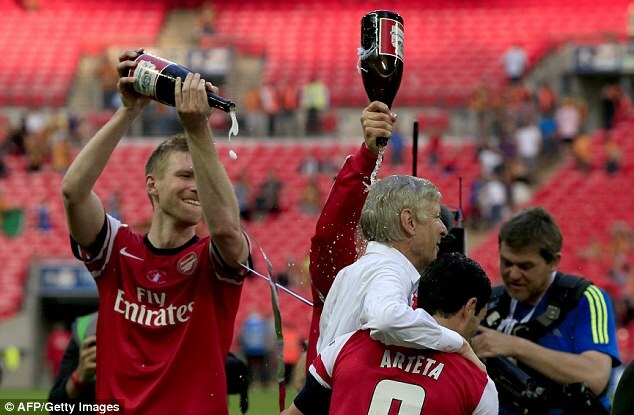 Arsenal’s 9 year trophy drought comes to an end, cue some epic celebrations. 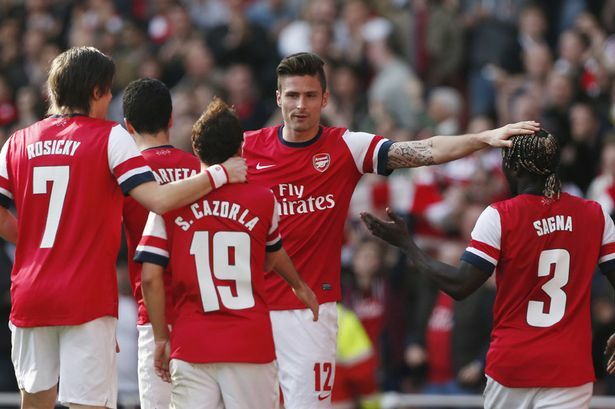 Arsenal destroyed Napoli in an opening 15 minute salvo, which started with a cracking 8th minute goal from Mesut Ozil. Olivier Giroud held off a Napoli defender, releasing Ramsey on the right wing. The Welshman then played a perfectly directed pass into the path of Ozil, who crashed the ball home subtly. What a way to open your goal scoring account! Tomas Rosicky and Olivier Giroud combine well to set up Wilshere to low drive home the equalizing goal in the 62nd minute. Having been set up by Wilshere, Ramsey leaves two Norwich defenders bewildered, before unleashing a powerful shot past the Norwich goalie. The Welshman scored a peach, as he collected a pass from Mesut Ozil, and shot a half volley from 25 yards, leaving Simon Mignolet with no chance whatsoever. Santi Cazorla brings the ball in from the left, before Giroud and Wilshere bamboozle the Norwich defense with a series of intricate flicks, for Wilshere to score Arsenal’s magical opener. Now that we have had a look at Arsenal’s 10 best games of the season, here’s a look at the worst! 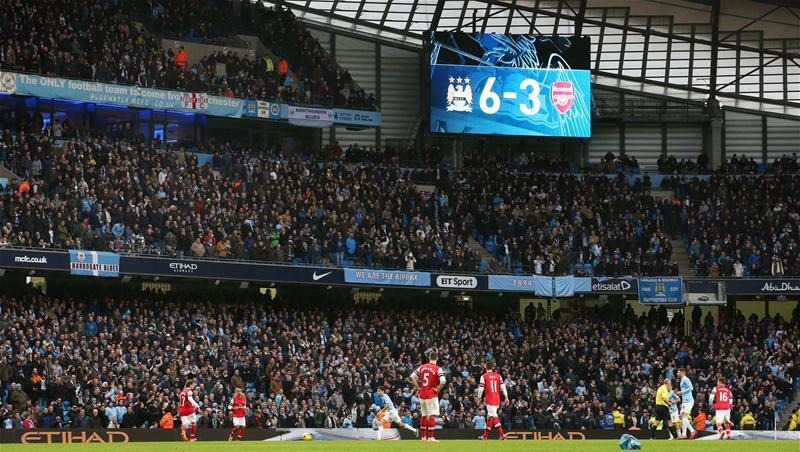 Manchester City continued their incredible home form by trouncing Arsenal 6-3 in a goal fest at the Etihad. Theo Walcott made a return to the starting lineup for Arsenal, but it was Sergio Aguero opening the scoring with an acrobatic effort off a corner. Theo Walcott equalized on 31 minutes, with a simple finish past Romanian Pantilimon, before Negredo tapped home City’s second from close range, just before half time. A loss of possession resulted in Brazilian Fernandinho curling the ball past Szcsesny, before Walcott scored a beautiful second to reduce the deficit to 3-2. 3 minutes later, David Silva made it 4-2 after a well worked move. From there on Arsenal looked tired and sluggish in midfield, losing the ball far too often. Fernandinho scored again to make it 5-2 in the 88th minute. Mertesacker’s goal in the 92nd minute seemed like consolation, but Yaya Toure added the cherry on top of City’s cake, scoring a penalty in the 95th minute. The match culminated in a spat between compatriots Mertesacker and Ozil. Arsenal emerged as the losing side in a rather closely contested game between two sided matching in quality, in an intense encounter at Old Trafford. The difference turned out to be a fine header by Robin van Cunty, and his celebration thereafter did create a furor among the Arsenal faithful. 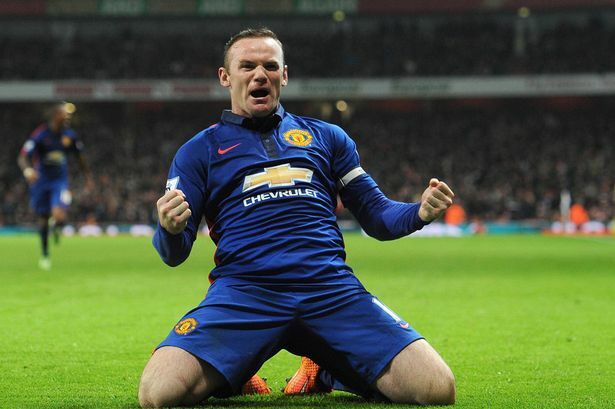 To add to that, it was another accomplished performance from Wayne Rooney, so often the thorn in Arsenal’s side. 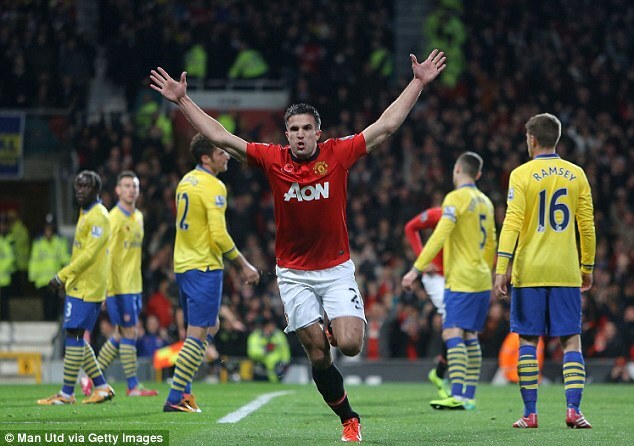 The Gunners enjoyed pockets of fine passing, yet failed to breakdown a stringent United side. Giroud, Ozil, Bendtner all missed some good opportunities to score, as the Red Devils closed the gap between the two sides on the league table. In a dour match, Napoli defeated Arsenal 2-0, yet failed to qualify to the knockout stages of the Champions League, with Arsenal just about catching the last boat, after Dortmund beat Marseille 2-1 in France. Both sides were locked in an intense physical, midfield-oriented and scrappy football battle, which was interrupted far too often by the referee’s whistle. Gonzalo Higuain, who chose Napoli over Arsenal in the summer, put the home side ahead in the 73rd minute, with a fine left footed shot. The Italian side looked content with the result, as Dortmund were unable to find a winning goal in France. As news poured in of a Dortmund goal, there was a barrage of attacks, with another Real Madrid import Jose Callejon scoring in the 92nd minute. 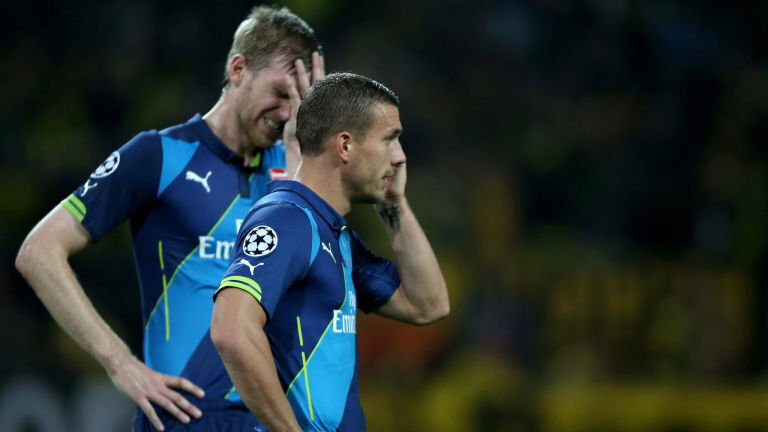 But, it was a case of too little too late, as Arsenal made it through to the next round. Just about. Arsenal’s fine unbeaten streak of 12 matches came to an abrupt end as Borussia Dortmund produced the perfect away European performance to take home 3 points. Dortmund’s first goal came on 16 minutes, when the in-form Aaron Ramsey misplaced his pass, only for Armenia international Henrikh Mikhitarayan to score the opening goal. Mesut Ozil was given a hard time by his former rivals, as Dortmund efficiently marshalled the midfield. However, a misunderstanding between goalkeeper Weidenfeller and Subotic resulted in Giroud capitalizing and scoring the equalizer for Arsenal. The Gunners looked industrious in the second half, creating more opportunities, but the lethal Pole Robert Lewandowski struck the winner with 7 minutes of normal time to play. Arsenal got off to the worst possible start in the new Premier League season, losing at home to an average Aston Villa side. Despite a bunch of debutantes, Aston Villa were made to look like a superior side on an error-strewn afternoon. However, it was the Gunners who had the better start, Olivier Giroud tapping home the opener past Brad Guzan in just the 6th minute. A physical battle ensued, as both sides looked to play ugly. Agbonlahor and Benteke were causing many problems for Arsenal’s defensive pairing of Mertesacker and Koscielny, and the Villains equalized on 22 minutes, when Agbonlahor was bought down by Szczesny. Benteke missed, but scored off the rebound. Both sides had some opportunities, clear and tough to take the lead, but no one did till Villa in the 61st minute. Koscielny was harshly adjudged to have bought down Agbonlahor, and this time Benteke made no mistake in dispatching the penalty. Minutes later, matters became worse as Koscielny was sent off, and Antonio Luna made it 3-1 to the visitors, as Arsenal poured men forward in search of an equalizer.